Dinner: For Tina's birthday (the day before, but Sunday worked out better for us), we went to Uchi (801 South Lamar Boulevard, Austin, TX‎ - (512) 916-4808‎) with Braden and Kelly. 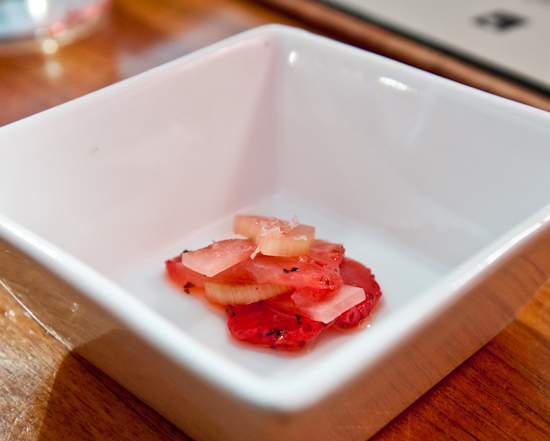 Amuse bouche - cured strawberries, pickled rhubarb, and watermelon radishes. 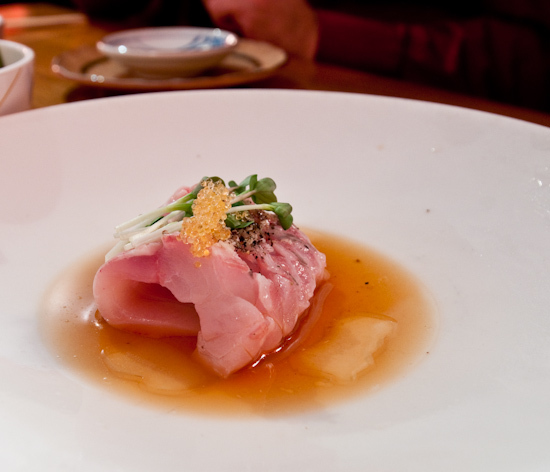 The amuses that we've had in the past at Uchi have showcased Chef Cole and Chef Qui's skill at balancing strong flavors. 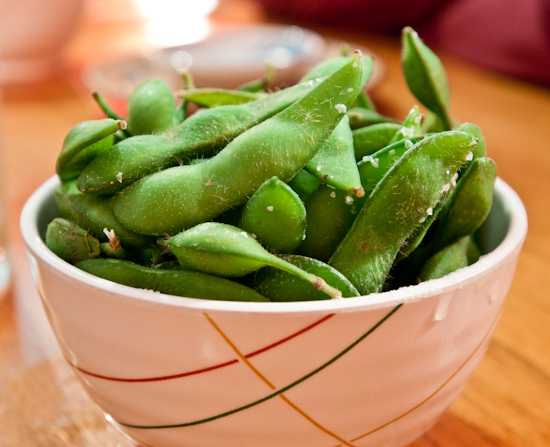 Unfortunately, we didn't feel this simple starter was a good representation of the food at Uchi. Lunch: We ate a quick lunch of leftover pizza from BJ's Brewhouse to make sure we had enough time to prepare Hairy to meet some potential adopters. Dinner: To celebrate Tina's birthday, we went to dinner and a movie. Dinner was at Rudy's BBQ where they assemble your order in layers into a crate. 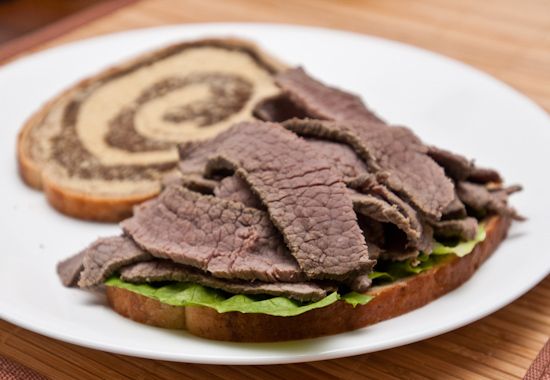 Lunch: We boiled the corned beef brisket for one minute to reduce its saltiness a bit - this worked perfectly. Dinner: We went to BJ's Brewhouse to have the other couple appetizer flatbread pizzas that they have. 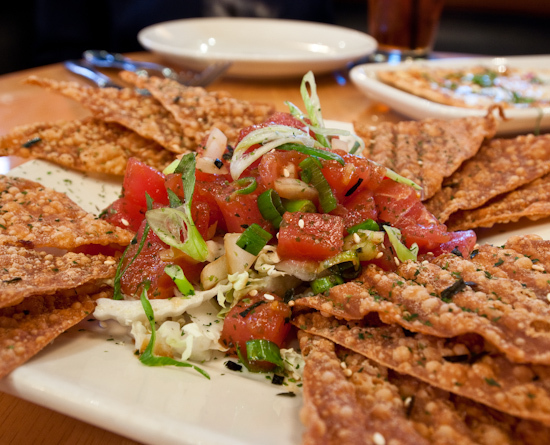 Ahi Poke Chopped sashimi-grade ahi and green and yellow onions are marinated in our signature poke sauce. Topped with diced avocados and served with crispy wonton chips. This was pretty good at the beginning but I don't think the later pieces of tuna had enough poke sauce on them. Also, too many won ton chips - but they were flavorful with and without the ahi poke. 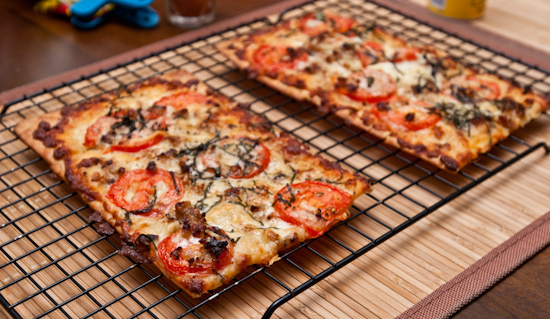 Margherita Fresca Flatbread Appetizer Pizza A classic Italian recipe with fresh mozzarella cheese and sweet tomato sauce. 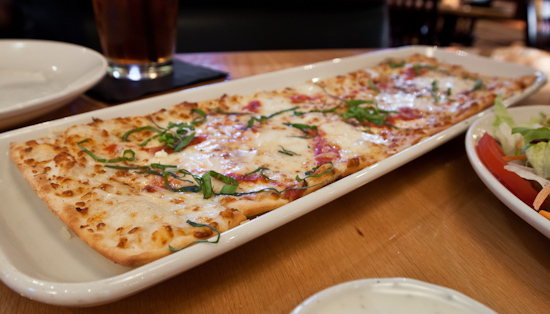 Garnished with fresh basil and Parmesan cheese. A tad sweet due to the tomato sauce. 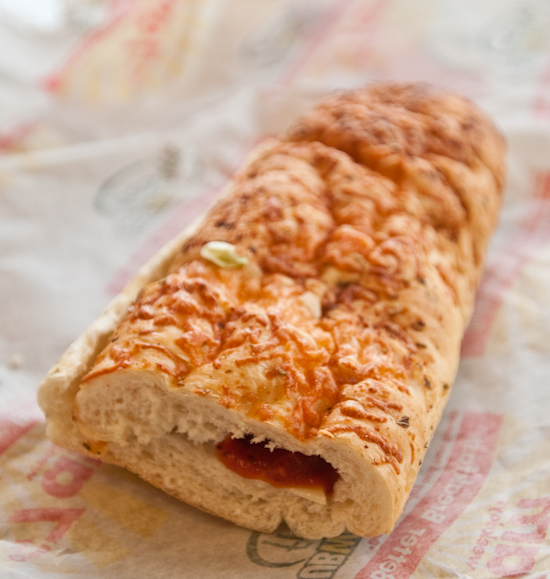 Lunch: I had a sorry looking 6-inch Meatball Sub on Italian Herbs and Cheese Bread from Subway. Dinner: We went to Azul Tequila (4211 South Lamar Boulevard, Austin, TX‎ - (512) 416-9667‎) where I ordered the Carne Guisada plate for dinner. It was simple, but it really hit the spot. 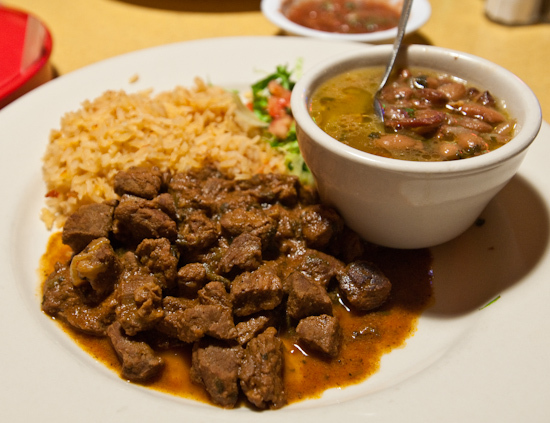 The house made corn tortillas went perfectly with the chewy but flavorful beef tips. 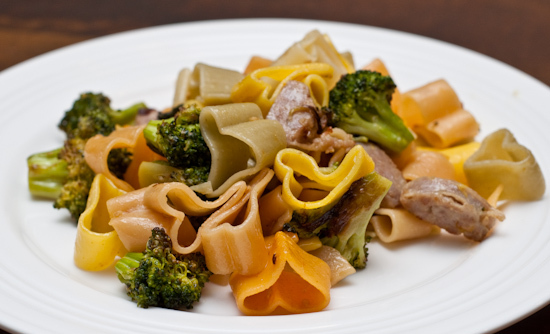 Dinner: Tina made a pasta out of heart-shaped pasta, sliced bratwurst, roasted broccoli, and fresh NatureSweet SunBursts tomatoes. 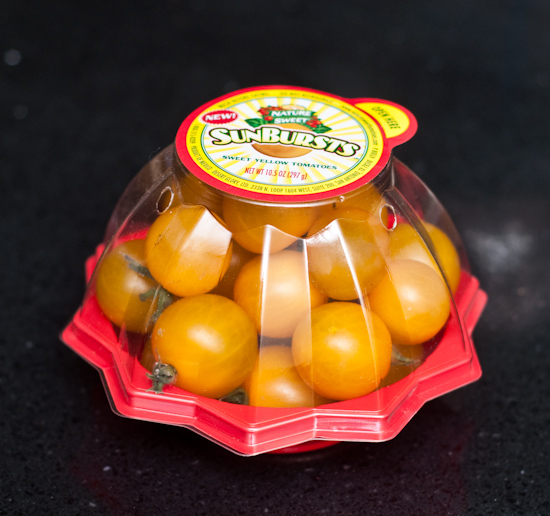 These tomatoes are super-sweet and have a full flavor. If you see them in the supermarket, I'd recommended picking up a pack to eat out of hand or toss (fresh) into pasta like Tina did. Dinner: I went to a food blogger tasting event at Gibson Bar and The Trailer (1109 South Lamar Boulevard, Austin, TX‎ - (512) 386-1345‎). They had a several fresh takes on the typical bar food. There wasn't a single thing I tasted that I didn't like. Buenos Dias All-beef hot dog split and seared, wrapped in bacon, topped with a fried egg and melted American/Swiss Cheese. This was my favorite. There's nothing special that I could tell about the hot dogs they use - salty and firm textured. 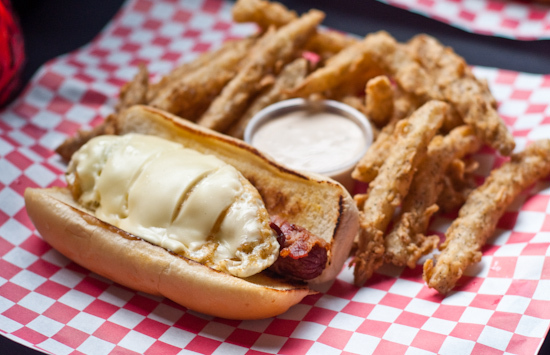 The fried egg and bacon make this hot dog awesome though. Dinner: We ate dinner at Jeffrey's (1204 West Lynn Street, Austin, TX‎ - (512) 477-5584‎) where former First Lady Laura Bush was also dining (she was eating at a table in the bar while we chose to dine in the dining room - they even offered us a table in the bar but we turned it down not realizing we were standing in a room with someone famous while inspecting our tables). 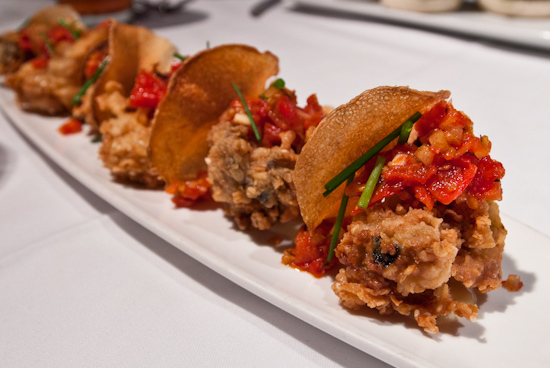 Crispy Oysters - Octavia on house-made Sea Salt Potato Chips Bacon Royale with "Overnight" Tomato Vinaigrette. Very good - crispy with a clean flavor and well-balanced with the tomato dressing. 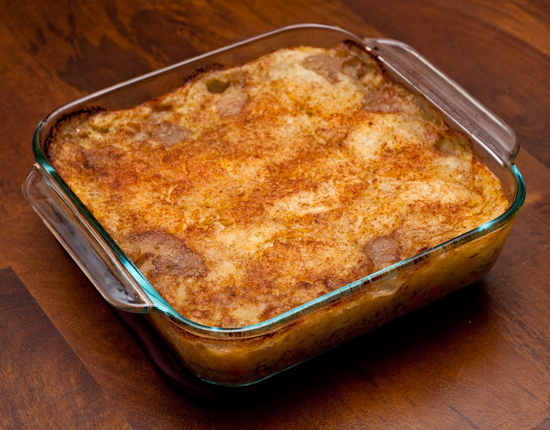 Dinner: Because the series finale of Lost was airing tonight, I decided to make Shepherd's Pie (in honor of Jack Sephard). Dinner: We tried for that 9:50pm movie again, but this time left much earlier for dinner. Across the street from the theater is a Romano's Macaroni Grill - an Italian food chain that we haven't dined at in years - so that's where we ate. 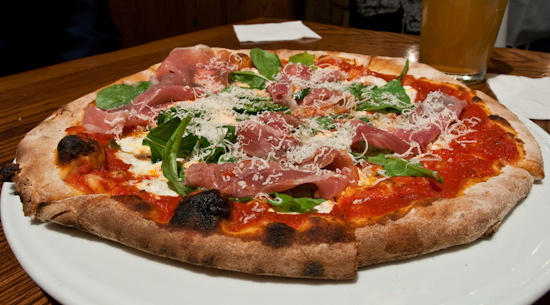 We started with their Prosciutto e Arugula Neapolitan Pizza which had a nice crispy and chewy texture. Unfortunately, the pizza could have been a little more flavorful (it was fairly subdued). 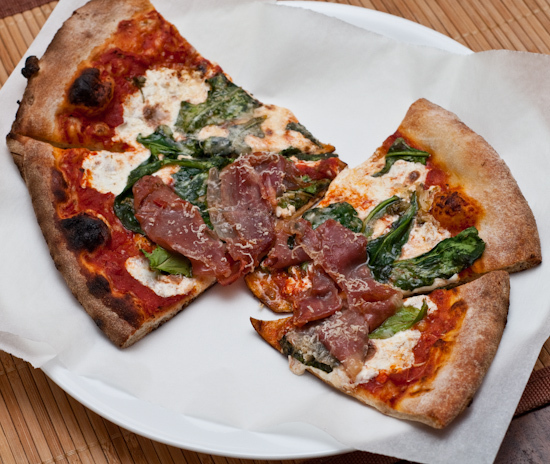 A few mouthfuls were perfectly flavored though - great balance of mozzarella, peppery arugula, and savory prosciutto.